Republican (and “Libertarian”) senators indicating they will try to kill the agreement, thereby moving the United States toward a war on Iran: 54. Democratic senators inspired during the repulsive Republican debate Thursday night to announce that they will try to kill the deal (and would rather have a war): 1. Democratic senators who haven’t clearly stated a position: 29. The number of those 29 who would have to join Schumer to kill the agreement and set the United States on a path toward self-isolation, international disgrace, and disastrous illegal immoral catastrophic war that will make Iraq and Afghanistan look like diplomacy: 12. Can we keep the agreement protected from such a fate? Of course we can. We’ve been stopping a war on Iran for many years now. We stopped it in 2007. Such things never enter U.S. history books, but wars are stopped all the time. In 2013, the push for a massive bombing campaign on Syria was hard and absolutely bipartisan, yet public pressure played the key role in stopping it. Now we have the White House on our side for godsake. When Obama wants a horrible corporate trade agreement fast tracked or a supplemental war spending bill rammed through or a “healthcare” bill passed, he twists arms and offers bribes, he gives rides on his airplane, he sends cabinet secretaries to do PR events in districts. If he really wants this, he’ll hardly need our help. So one strategy we need to keep after is making clear he knows we expect this of him. Senator Sanders has a gazillion fans now, and something like all but 3 of them believe he is a hero for peace. If you’re a Bernie supporter, you can urge him to rally his colleagues to protect the Iran agreement. In states like Virginia where one senator is taking the right position and one is keeping quiet, urge the first one (Kaine) to lobby the other one (Warner). Would-be senators like Alan Grayson who want people to think of them as progressives but who have been pushing to kill the deal since before Schumer slithered out from under his rock, should be hounded everywhere they show their faces. Schumer himself should not be permitted to appear in public without protest of his warmongering. Just as in the summer of 2013, most senators and house members are going to be at public events in the coming weeks. Email and call them here. That’s easy. That’s the least anyone can do. And it had an impact last time in 2013. 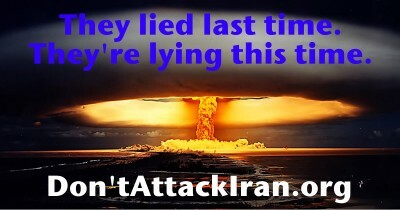 But also find out where they will be (senators and representatives both) and be there in small or large numbers to demand NO WAR ON IRAN. The most expensive weapons system they’ve got (“missile defense”) has been using the mythical Iranian threat as a ridiculous justification for picking your pocket and antagonizing the world in your name for years and years. But Raytheon wanted those missiles to hit Syria, and Wall Street believed they would. The Israel lobby has much of Congress bought and paid for. But the public is turning against it, and you can shame its servants. In the long run, it’s useful to remember that lies do not set us free. If both proponents and opponents of the agreement depict Iran falsely as a nuclear threat, the danger of a U.S. war on Iran is going to continue, with or without the deal. The deal could end with the election of a new president or Congress. Ending the agreement could be the first act of a Republican president or a Schumerian Democratic Leader. So, don’t just urge the right vote while pushing the propaganda. Oppose the propaganda as well.